What is an Indiana Promissory Note? Indiana Promissory Note: What Is It? An Indiana promissory note is a written document that memorializes a loan between a lender and a borrower. It is subject to security laws in Indiana. Promissory notes may be secured or unsecured. A secured promissory note promises that if the borrower doesn’t repay the loan that the lender will receive a piece of collateral. A car loan or mortgage are two examples of a promissory note. With an unsecured Indiana promissory note, the lender does not collect collateral if the borrower defaults. Under Indiana’s usury law, the maximum interest rate that may be charged on loans of less than $50,000 is 21%. The law also states that judgment interest rates cannot be greater than 8%. If there isn’t a written contract between the parties, the law states that the lender may not charge more than 8% interest. An Indiana promissory note should be titled in a way that reflects whether or not it is secured. Otherwise, it is likely that a legal dispute would result in the note being treated as unsecured. Then, there is certain information along with some basic clauses that should be included. The date the parties enter into the promissory agreement. This date is listed under the title. It should be listed as month, day, and year. The legal names and mailing addresses of the parties. The parties should also be designated by their titles: lender, borrower, and, if necessary, cosigner. If the Indiana promissory note is secured, include the physical address of the borrower. If the payment address is different from the lender’s mailing address, the payment address should be included in the section that discusses payments. The principal amount of the loan. This is the amount that the borrower receives. It does not include interest. Interest is mentioned in its own section. Before executing an Indiana promissory note, double check that the amount listed as the principal balance is accurate. Interest. Interest is expressed either as per annum (per year) or as the annual percentage rate (APR). In Indiana, the amount of interest that may be charged depends on the amount of the loan and whether the agreement is in writing. Payments. Most Indiana promissory notes are repaid through installments. That is a certain amount of money paid at certain intervals. Monthly installments are most common. This section should list the total number of installments that must be paid, the amount of each payment, and whether a late fee will be assessed for late payments. If there is a late fee, the amount of the late fee should be listed. For secured Indiana promissory notes, an accurate description of the collateral must be included. Failure to include this information could result in the court treating the agreement as unsecured. Interest Due in the Event of Default. This is important when it comes to Indiana promissory notes because state law mentions an interest rate that is used if the lender gets a default judgment against the borrower. This clause is used to list the amount of interest that the borrower is responsible to pay if they default on the loan. Payment Allocation. This clause clarifies how payments are split between the principal balance and the interest amount. Prepayment. Prepayment occurs when a borrower pays their loan off before it is scheduled to end in the agreement. This clause mentions whether the borrower is penalized for paying off the loan early. Acceleration. This clause gives the lender the right to demand immediate repayment of the remaining balance if the borrower violates the terms of the agreement. Attorney Fees and Costs. 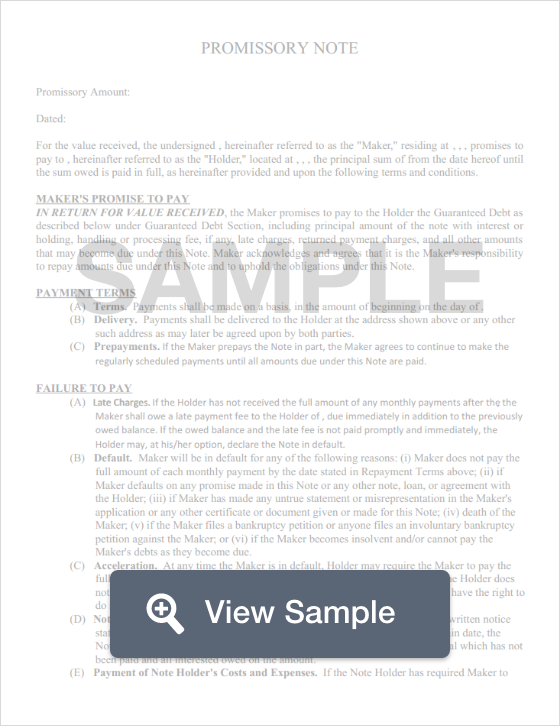 If a legal dispute arises over the promissory note, this clause governs how attorney fees and costs will be paid. Waiver of Presentments. This clause states that the lender does not have to be present for payments to be made on the loan. Severability. A severability clause keeps the rest of the agreement in effect if one provision is found to be unenforceable. Conflicting Terms. Addresses how conflicting terms will be handled, if any are found. It most commonly involves the creation of an amendment to clarify the terms. Notice. This clause explains whether the lender will notify the borrower if they plan to file a lawsuit against them for default. Governing Law. A governing law clause determines the state whose laws will be used to govern the agreement. An Indiana promissory note should be dated at the time it is signed. It should be signed by the borrower. If a co-signer is necessary, they should also date and sign the agreement. The signature should be signed by a witness as well as notarized.